We know you have many ideas to make yourself become the focus in a party, but if you need more innovative options, the Glow Threads t-shirt may draw your attention. 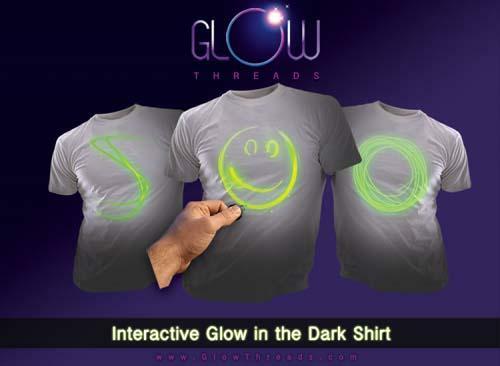 Glow Threads is a unique and interesting fully interactive glowing t-shirt designed to offer you an easy way to draw various glowing designs. The Glow Threads t-shirt features their unique UV mini lights on the front, back and even the sleeves that give you the ability to draw glowing designs over and over on the t-shirt using its Uv laser point, and the glow streak lasts between 45-60 seconds before fading. Apart from that, the Glow Threads t-shirts are as soft as any other t-shirt for wear comfortable and completely washable. After the break, check out the following demo video. The Glow Threads t-shirt along with an included Uv laser pointer is priced at $25 USD. If you’re interested, jump to Glow Threads official site for more details.